The cost for 22 drugs shot up more than 500 percent per dose from 2013 through 2017, according to a Bloomberg Government analysis of Medicare Part D data released by the Centers for Medicare & Medicaid Services. The median increase among drugs offered through Medicare’s primary prescription plan was 28 percent from 2013 to 2017, but some medications went up in price more than others. 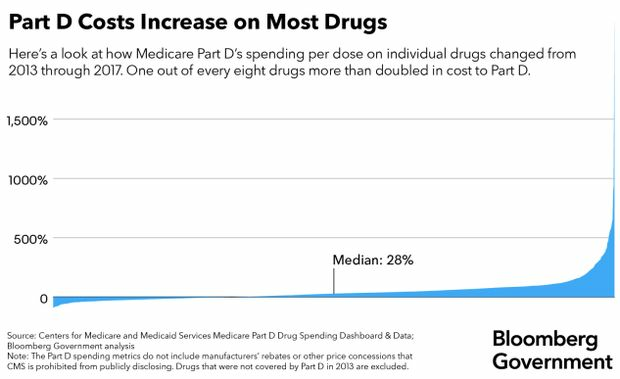 The median is the midpoint of the spending-change distribution, meaning that the same number of drugs changed in price more and less than 28 percent. Bloomberg Government analyzed 2,174 out of the 2,879 drugs with reported weighted averages for per-dosage spending in both 2013 and 2017. Overall, Medicare spent about $154.8 billion on 42.7 million Americans with Part D coverage in 2017. The CMS in March reported an average annual spending increase of 10.6 percent from 2013 through 2017. The data show that a relatively small percentage of drugs make up a disproportionate share of the spending totals for Medicare Part D. For example, 77 drugs out of the nearly 2,900 covered under Medicare’s primary prescription plan were responsible for slightly more than half of total spending in 2017, according to the analysis. The drug with the sharpest increase per dose was Thiola, which is used to treat a painful, rare genetic condition called cystinuria that causes frequent recurring kidney stones. Medicare spent 24 times as much per dose on Thiola in 2017 than in 2013—up to an average of $29.17 from $1.21. Thiola’s cost increases were because the company “invested significantly to build sufficient supply” of the drug and remove it from the Food and Drug Administration’s drug shortage list as well as improve access and provide “comprehensive education and support for physicians and patients,” said a spokesperson for Retrophin, the maker of the drug. The spokesperson said the price of Thiola had not been increased in more than three years and the company is investing in a “a more patient-friendly formulation” which the company hopes to release later this year. Another treatment for cystinuria, Cuprimine, was No. 2 on the list of cost jumps. Made by Bausch Health Companies Inc.—which changed its name from Valeant Inc. in 2018 amid criticism of its business practices—Cuprimine’s cost to Part D jumped 19-fold over five years. Bausch didn’t respond to requests for comment. Medicare Part D spent about $31.6 million on 211 patients who filled prescriptions for Cuprimine in 2017. Congress wants to address high drug prices, especially in the federal health programs, but there is little agreement on how to get there. House Democrats say Medicare should be able to negotiate with drugmakers on what it pays for drugs, allowing the largest single purchaser of medicine in the U.S. to try to get better prices. Most Republicans reject the idea. Rep. Peter Welch (D-Vt.), a leading voice on drug pricing in Congress, said he met with Sen. Charles Grassley (R-Iowa), the chairman of the influential Senate Finance Committee, who has vowed to take on the issue this year, to discuss expanding Medicare’s negotiating power, but found that Grassley was worried it would restrict some seniors’ access to certain drugs. “I don’t want to go there,” Grassley told Bloomberg Government. Sen. Susan Collins (R-Maine) pointed to Cuprimine and Thiola as evidence of “price gouging,” when companies dramatically raise the cost of a product only to garner high profits, not because production or research costs rose. In November 2015, Collins and Sen. Claire McCaskill, (D-Mo. ), the chairwoman and ranking member on the Senate Aging Committee, respectively, wrote a letter to Retrophin, the maker of Thiola, seeking more information on the dramatic increases in the price of the drug. In December 2016, the results of an investigation by the committee castigated the company for the price increases. According to an analysis of government data, the price of Thiola per dose increased $1.23 from 2015 through 2016, but actually dropped by 2 cents from 2016 through 2017. Collins and her Democratic counterpart on the Senate Aging Committee, Sen. Bob Casey (D-Pa.), said in a statement they’re pushing to publish the cost of drugs annually. “By knowing how much Medicare and Medicaid spend on prescription drugs, it will be easier to spot trends, identify problems and find solutions,” the pair said in a statement. In the House, aides for Speaker Nancy Pelosi (D-Calif.) have met with White House staff to discuss possible ways to address drug prices. A White House spokesman said the talks are preliminary. Meanwhile, lawmakers in the House are moving bills meant to stop brand name drugmakers from blocking low-cost generics from entering the market (H.R. 965) and to improve federal databases of patent filings so it’s easier to know when they’ll expire (H.R. 1503). Last October, Spring Pharmaceuticals LLC sued Retrophin Inc., the manufacturer of Thiola, and its former chief executive officer, Martin Shkreli, claiming the company closed its distribution system for Thiola to prevent generic competition from accessing the drug and entering the market. 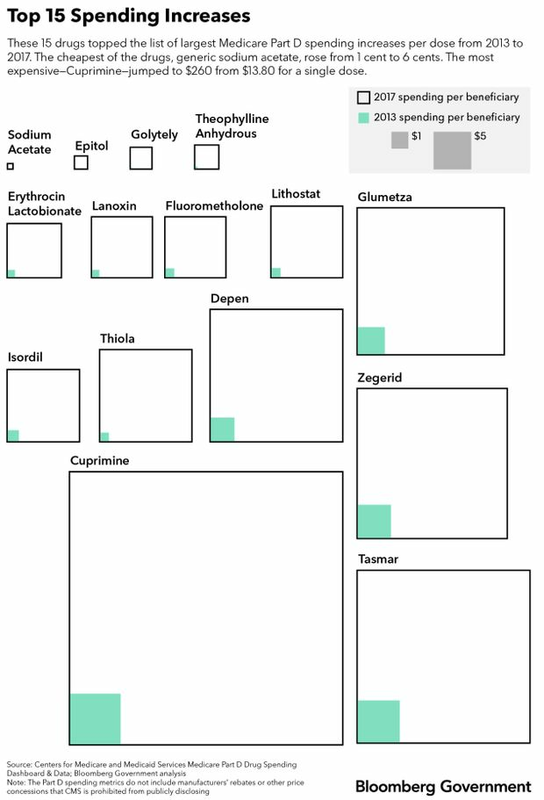 Several drugs with steep cost increases have been on the market for decades. Thiola hit the market in 1988. Cuprimine has been around since the 1970s. Medicare Part D spending for a single dose of Lanoxin, which was first approved in the 1950s, jumped seven-fold. Antidepressant doxepin capsules were first approved by the FDA in 1969, but in 2010 Silenor was approved as a new low-dose form of the drug intended to treat insomnia. Part D paid about 2.5 times more for a dose of Silenor in 2017 than it did in 2013. The average cost of a dose rose to $13.52 in 2017, up from just under $6 per dose in 2013. Part D spent about $31.2 million on Silenor in 2017. The new low-dose pill won Pernix Therapeutics—Silenor’s manufacturer—three years of exclusivity, which was initially supposed to expire in 2015. But before that exclusivity ran out, the company had filed 17 additional protections to sell the drug exclusively, according to Feldman’s research. The company could hold onto Silenor’s marketing rights until 2030, according to Feldman’s research. Pernix filed for bankruptcy in February, but says the drug will still be available. Some drugs with sharp increases, like Thiola and Lundbeck’s Onfi, are considered the gold standard for treating certain uncommon diseases and conditions. Those who need them have little choice but to pay whatever price pharmaceutical companies set. Onfi is FDA-approved to treat people with Lennox-Gastaut Syndrome, an incurable childhood-onset epileptic condition. People with epilepsy can die from the seizures it causes and need to take medicines to prevent them regularly, according to Jacqueline French, a practicing neurologist in New York who is also the chief science officer for the Epilepsy Foundation. French said even though the drug is approved for a childhood-onset seizure disorder, it is increasingly prescribed off-label to people with uncontrolled epilepsy. Part D spending on Onfi rose to $20.28 from $5.69 for a single dose over five years. About 10,000 people with Part D coverage filled a prescription for Onfi in 2017, up from just 208 patients in 2013. Total spending on the drug topped $123.7 million in 2017, according to the CMS’s Part D data. “In those cases where you don’t have competition, the patients and taxpayers are at the mercy of the companies for deciding how they’re going to set prices,” Vanderbilt’s Dusetzina said. Lundbeck’s data show a 106 percent increase in price for Onfi between 2013 and 2017. Rachel Vann, a spokeswoman for the company, attributed Onfi’s price increase to a new formulation approval the drug attained in 2012; unsuccessful attempts to get the drug approved for a new indication for a rare epilepsy disease—Dravet syndrome; and the fact that the drug covers a small population. “The cost is spread across a very small number of people and the investment we’ve made has to be recouped,” she said. The patent for Lundbeck’s Onfi expired in October 2018 and several generic versions of clobazam were approved shortly after. Medicare Part D data provides the dollar amount spent by the federal government, not the list price of the drug itself. Lundbeck declined to provide Bloomberg Government with data on the manufacturer’s Part D rebates for Onfi. Dusetzina said drug manufacturers like to argue that list prices are irrelevant because of rebates or other privately negotiated discounts. But for many Medicare patients, the list price matters a lot, Dusetzina said. Part D does not publish data on individual drug rebates, but in 2014 the CMS reportedan overall 17.5 percent rebate on name-brand drugs—a total of $16.2 billion out of $93 billion.